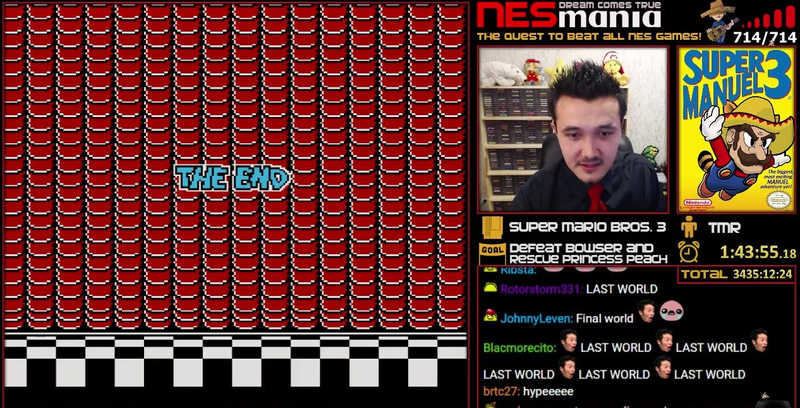 Piotr Delgado “The Mexican Runner” Kusielczuk has been trying to beat every NES game ever since 2014, and earlier today he finally succeeded. His journey ended after completing the final world of Super Mario Bros. 3, three years since he originally took up the challenge after a friend jokingly suggested he try it. To celebrate the long voyage and everything it’s meant, Kusielczuk began playing his guitar and singing as well as re-capping ten of his favorite memories from the over 3,000 hours it took him to complete the challenge. While some of the games have been short, like Super Mario Bros. 3, others, like Miracle Piano Teaching System took longer to beat than most RPGs. His list of 714 NES games included everything that was ever released in North America for the system as well as 35 PAL-exclusive games, including ones without obvious win conditions. In this regard, the trials and tribulations Kusielczuk put himself through were as much about endurance and repetition as retro-gaming prowess. You can count how long it took Kusielczuk to finish playing the NES catalog by the precise number of minutes (206,112), the number of days (north of 900), or the number of different shirts he’s worn on stream (a lot). An accomplished speedrunner, Kusielczuk has records in both Battletoads and Contra, but the NESMania Quest was clearly about more than that. It was almost an inversion of the formula. Instead of seeing how quickly he could be a particular NES game, he tried to see how long he could stand to play all of them. As a result, Kusielczuk has become the first person in the world to play all 714 games to completion, although we all know he won’t be the last. You can see more of the stream from his journey’s end here.